Utah County BMX badass, RamRod Murray, stretching it out in the air at Fezzari’s spring parking lot sale. 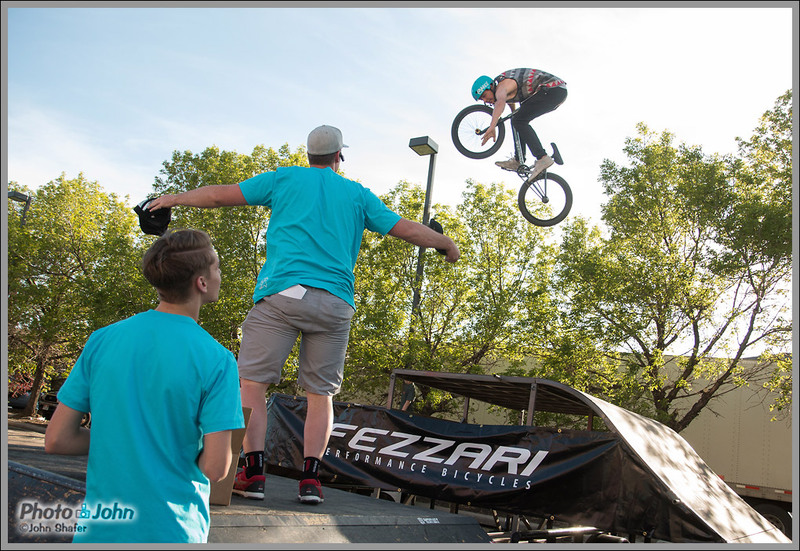 Utah bike manufacturer Fezzari threw down a big spring parking lot party and sale last Friday, at their Lindon headquarters. 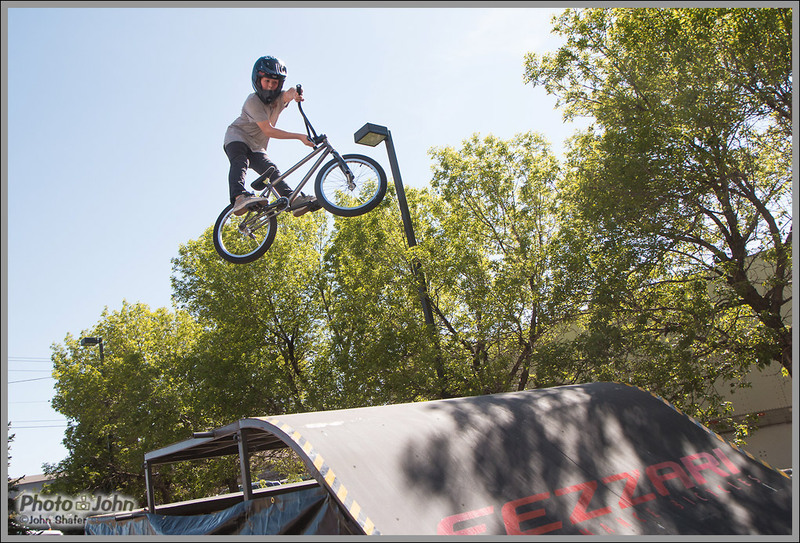 There were deals on bikes and gear, aerial BMX shenanigans, a raffle, and a couple of food trucks. 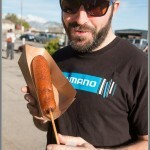 When I found out there was going to be a corn dog truck, there was no way they could keep me away. 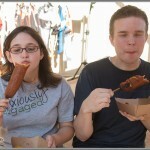 Although my real goal was to consume corn dogs and waffles, I also brought a camera to document the goings on. 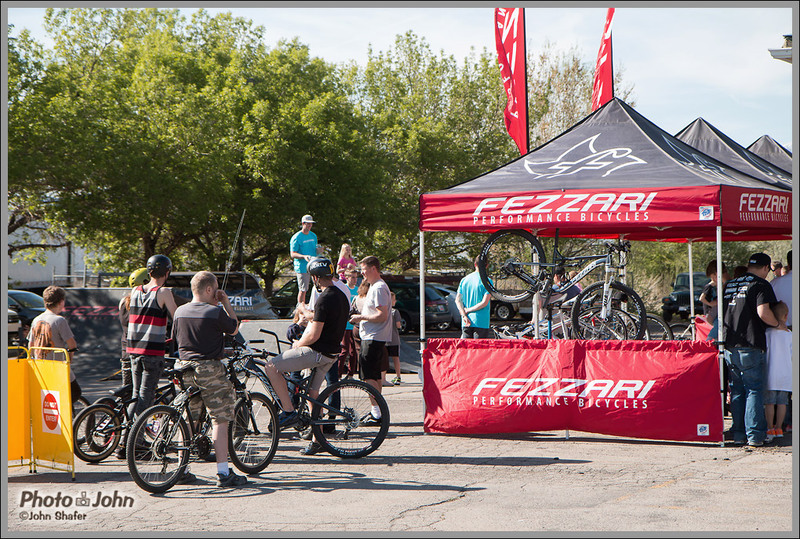 Read on to learn more or just scroll on down to the gallery to see my Fezzari bike spring sale event photos. Fezzari brought in food trucks with waffles corn dogs to feed the people who came to their spring parking lot sale. 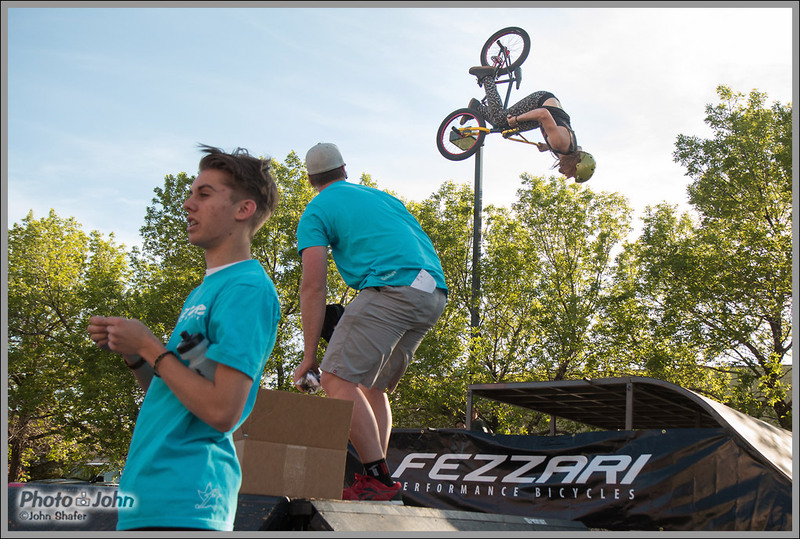 During the raffle at Fezzari’s spring sale and party, BMX riders were throwing down huge tricks on the box jump in the parking lot. 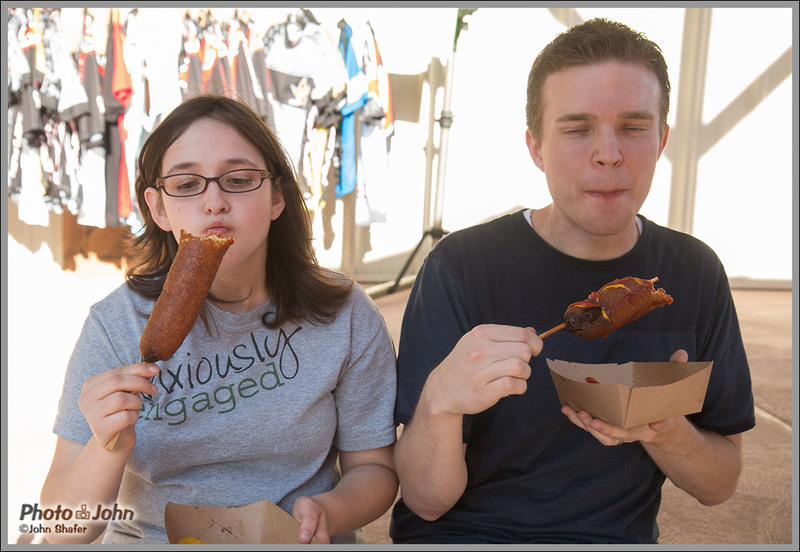 I wasn’t joking about the corn dogs. 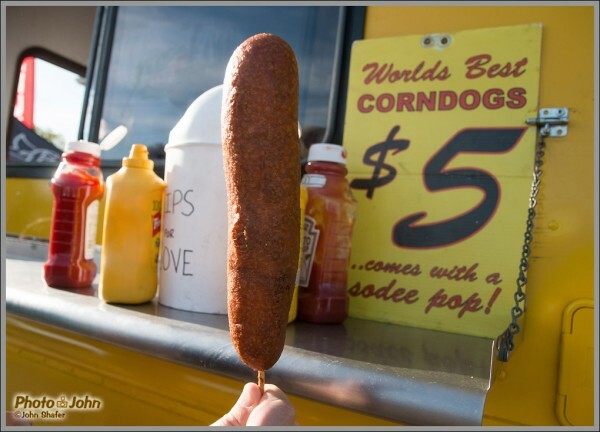 I have a serious weakness for deep-fried wieners coated in cornmeal and covered with mustard. Yum! 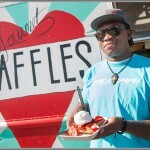 The corn dog truck sealed the deal for me but I also had a waffle from the I Heart Waffles truck. 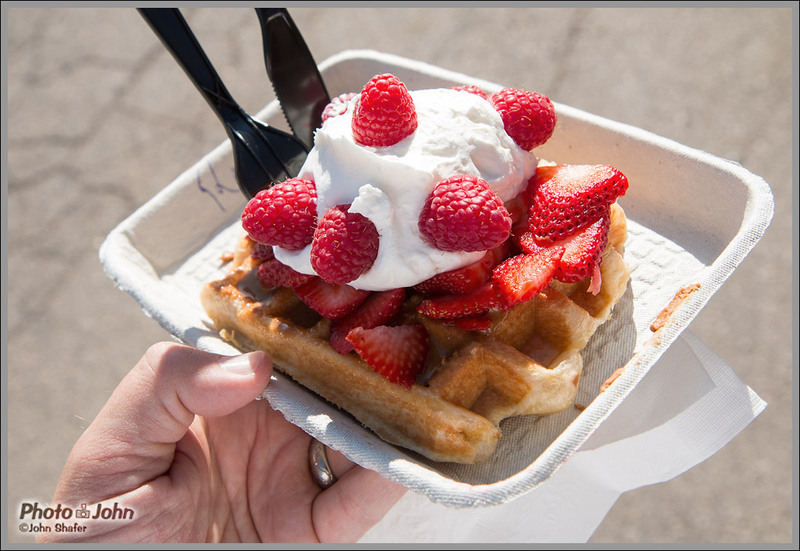 If you’ve never had a “liege waffle,” you’re missing out. They have a sugary batter that caramelizes in the waffle-maker so there’s a sweet, crispy crust. Generally you eat them with toppings like whipped cream and fruit, which are a perfect complement to the crunchy, sugary pastry. 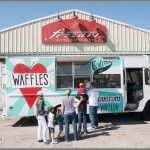 I had “the Works,” which the waffle truck dudes said was their most popular offering. It was topped with Biscoff cookie butter, cream, strawberries and raspberries. It was delicious! 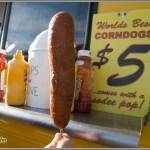 They call it the World’s Best Corn Dog. Who am I to argue? Ziggy Ansah, a friend of Fezzari Bicycles, ex-BYU football star and Detroit Lions defensive end, shows off the waffle he got from the Waffle Love food truck at Fezzari’s spring parking lot party. 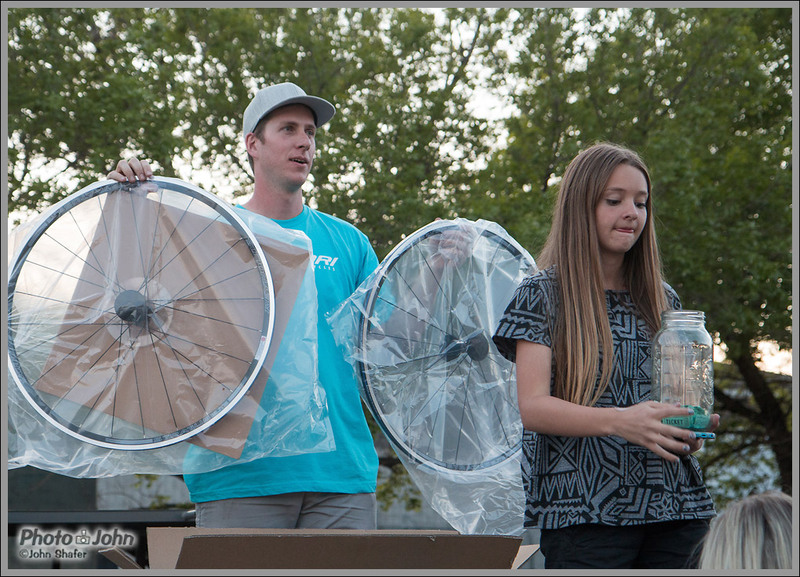 Oh yeah – the bikes. 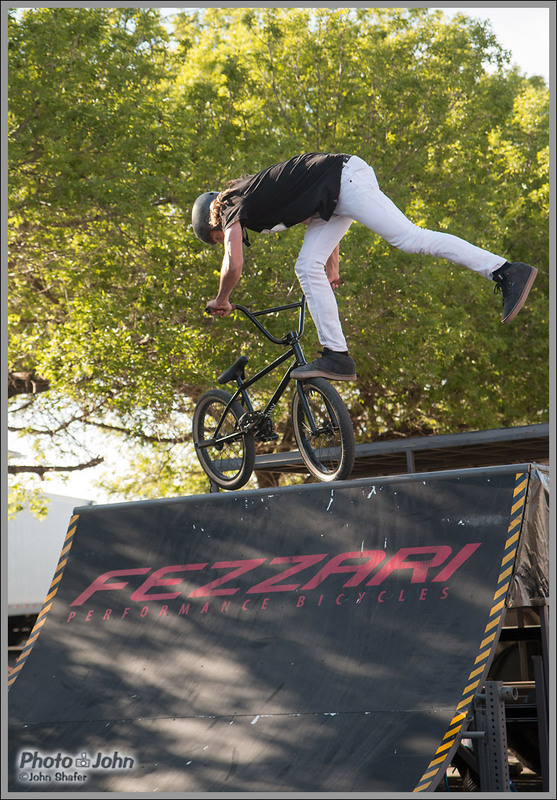 Fezzari is a direct-to-consumer bike maker located in Utah County, about 45 minutes south of Salt Lake City, Utah. 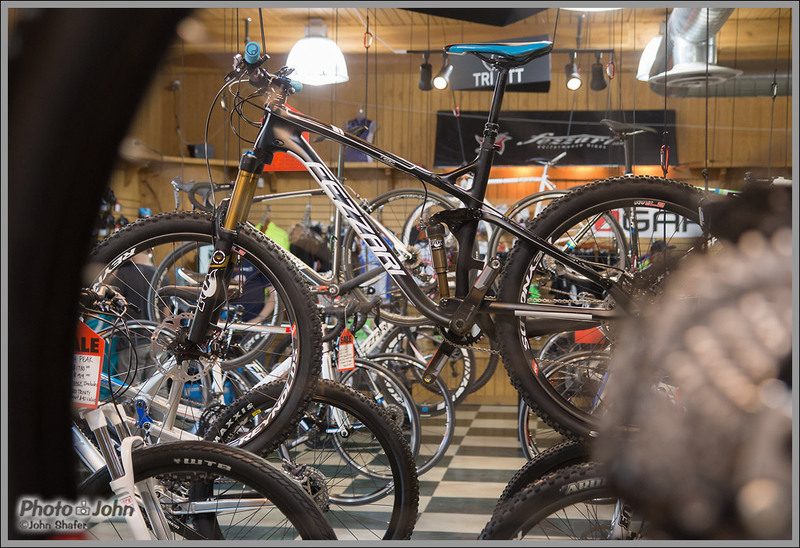 They make a full range of mountain, road and hybrid bikes, from entry-level to the very, very high-end. 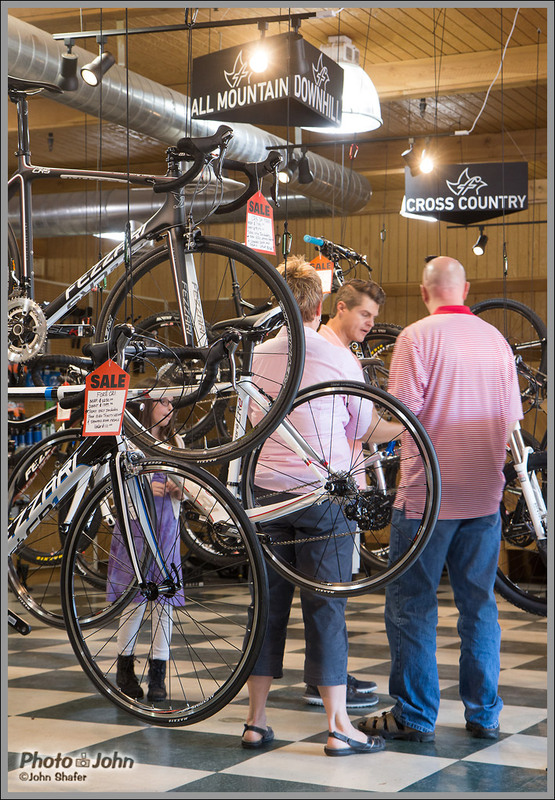 Their specialty is custom fitting – even though most of their customers don’t live in Utah and order via the Internet or phone. 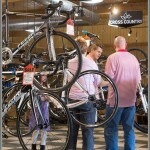 And because they deal direct and cut out the middleman, the buyer gets a whole lot more for their money. Case-in-point – the all-carbon Timp Peak mountain bike (see, below), which has 27.5-inch wheels, 150mm of travel, and sells for thousands less than comparable bikes from boutique brands. 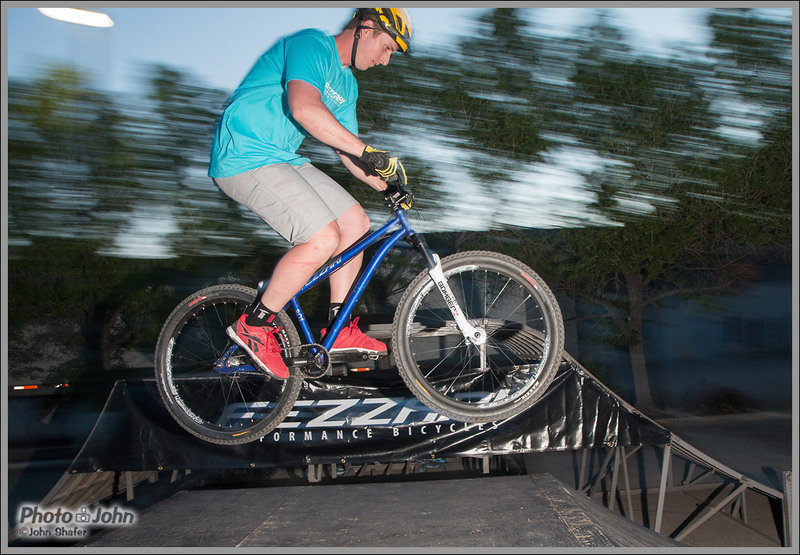 I’ve had my eye on the Timp Peak for a while and there’s a very good chance I’ll have one in my garage before this season is over. 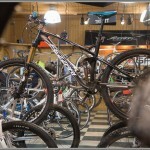 Fezzari’s top-of-the-line mountain bike, the all-carbon, 27.5-inch wheel, 150mm travel trail bike. 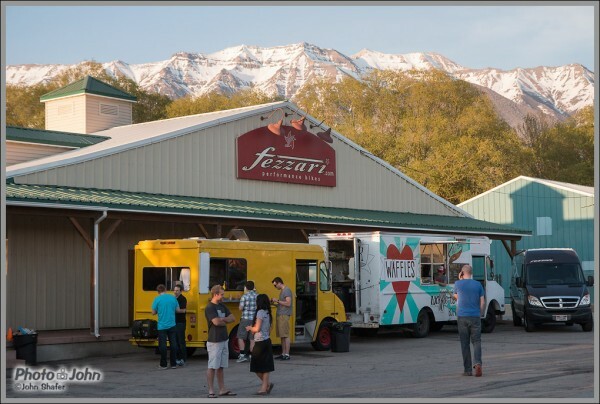 Fezzari’s spring parking lot sale was the first they’ve ever had but I expect there will be many more. 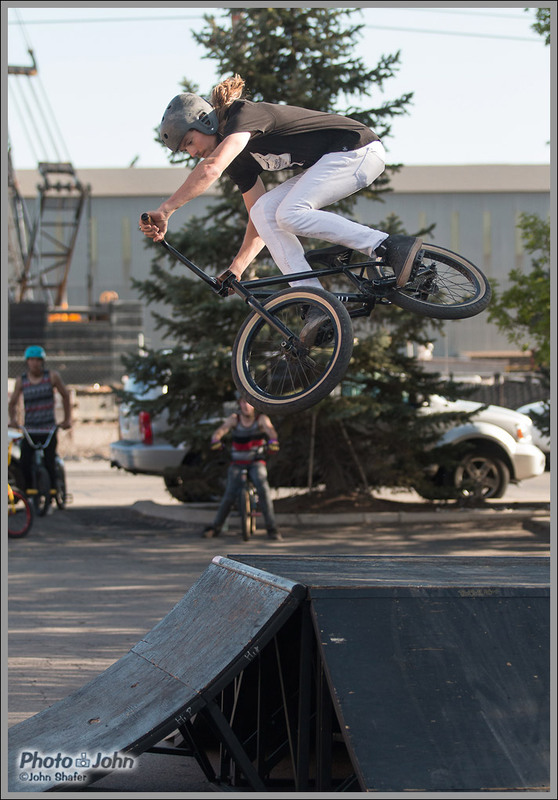 There were lots of people having fun, the food was great, and I’m pretty sure they sold a bunch of bikes. 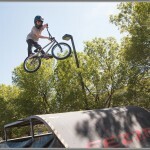 I had a great time, took lots of fun photos and got to eat a corn dog and a waffle. The only way my day could have been better is if I’d left with a new Fezzari Timp Peak and gone for a ride. 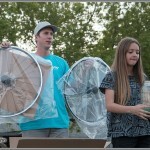 A lucky raffle winner winner at Fezzari Bicycles’ first spring parking lot event. 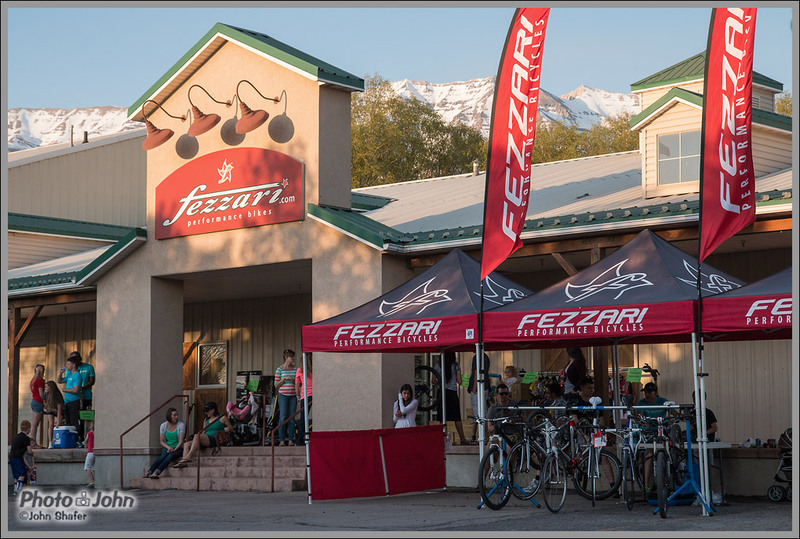 Fezzari Bicycles main office and showroom in Lindon, Utah, during their first spring parking lot sale and party. 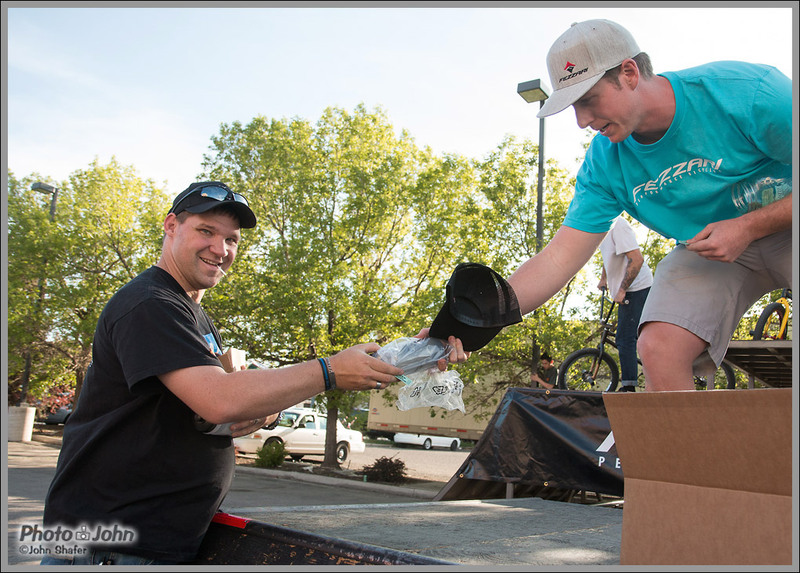 Do you have an event that needs photo coverage? 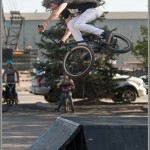 Do you like the photos you see here? 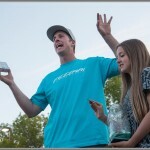 Contact me if you’d like me to photograph your party, tradeshow, fundraiser or corporate event! 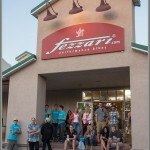 Customers being helped in Fezzari’s Utah County showroom. 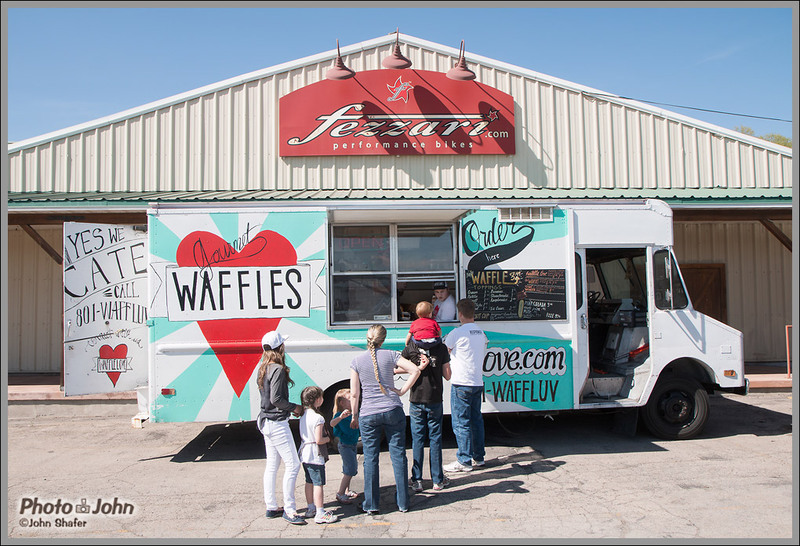 The Waffle Love food truck at Fezzari’s spring parking lot event. 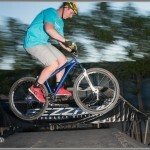 A good old-fashioned X-up, during Fezzari Bikes’ spring parking lot sale and party. 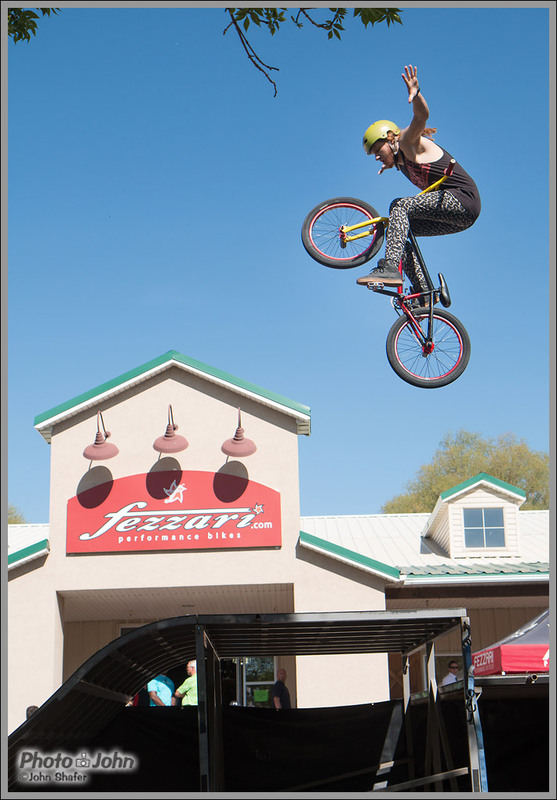 BMX fun during Fezzari Bicycles’ first spring parking lot sale and party. BMX aerials over the Fezzari Bicycles headquarters in Linden, Utah. 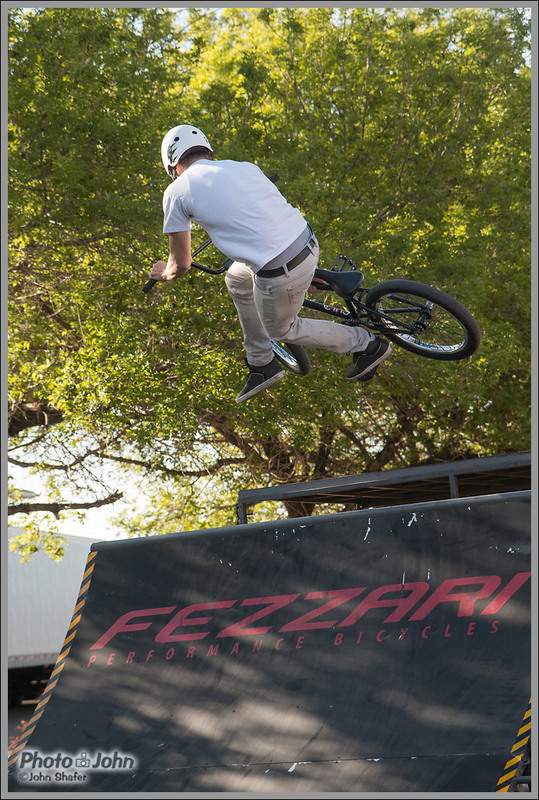 BMX riders waiting their turn to hit the box jumps at Fezzari’s spring parking lot sale and party. 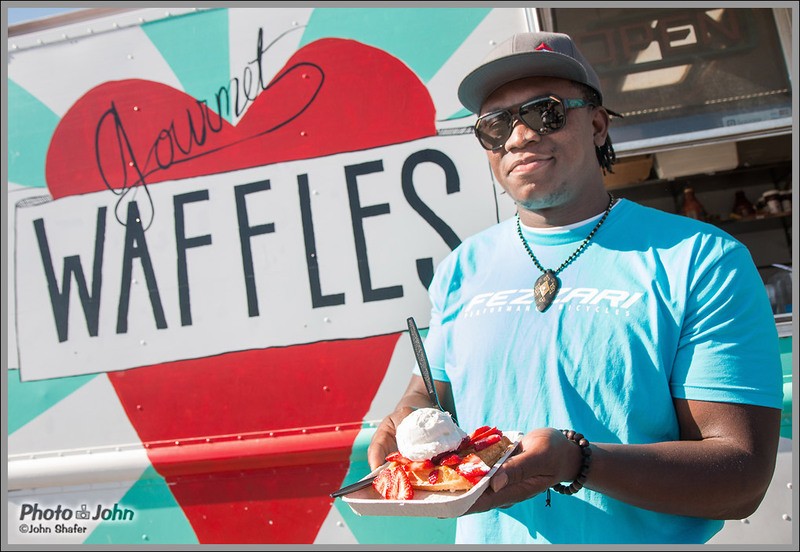 Ziggy Ansah, a friend of Fezzari Bicycles, ex-BYU football star and Detroit Lions defensive end,, shows off the waffle he got from the Waffle Love food truck at Fezzari’s spring parking lot party. 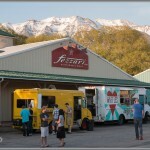 “The Works” waffle from Utah County’s Waffle Love food truck. 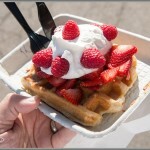 This “liege waffle” is topped with Biscoff cookie putter, cream, raspberries and strawberries. 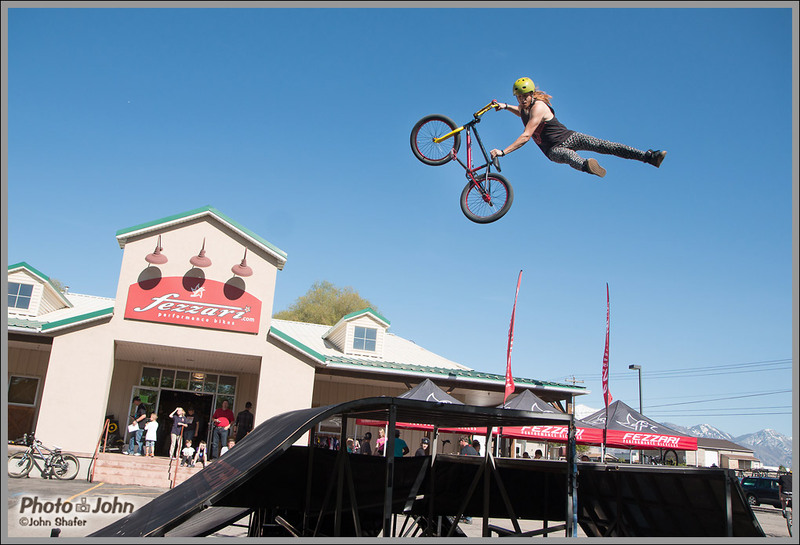 A little BMX hip jump action at Fezzari’s spring parking lot party. 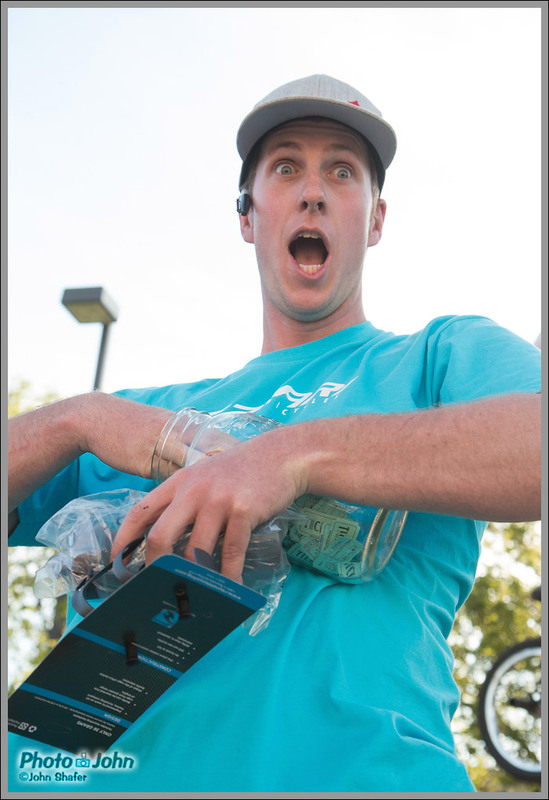 Fezzari marketing dude Tyler Cloward, hams it up during the raffle at Fezzari’s spring parking lot sale and party. 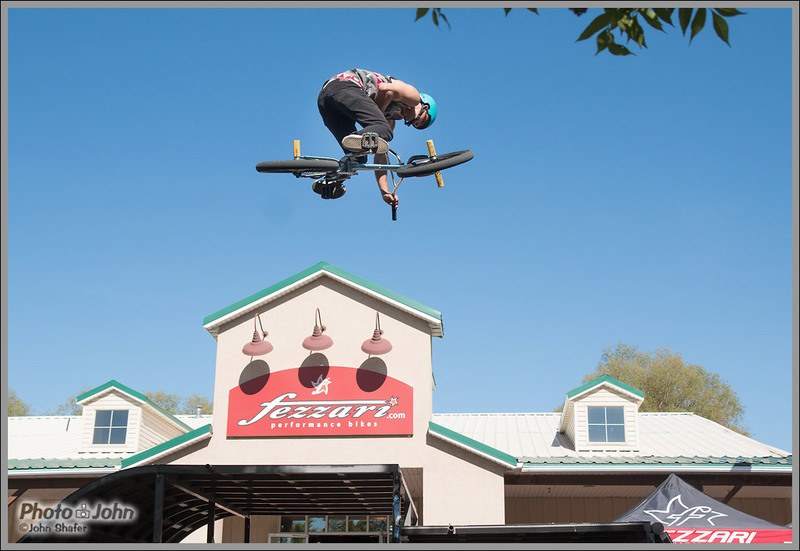 A BMX rider does a backflip during a raffle at Fezzari’s first spring parking lot sale and party. 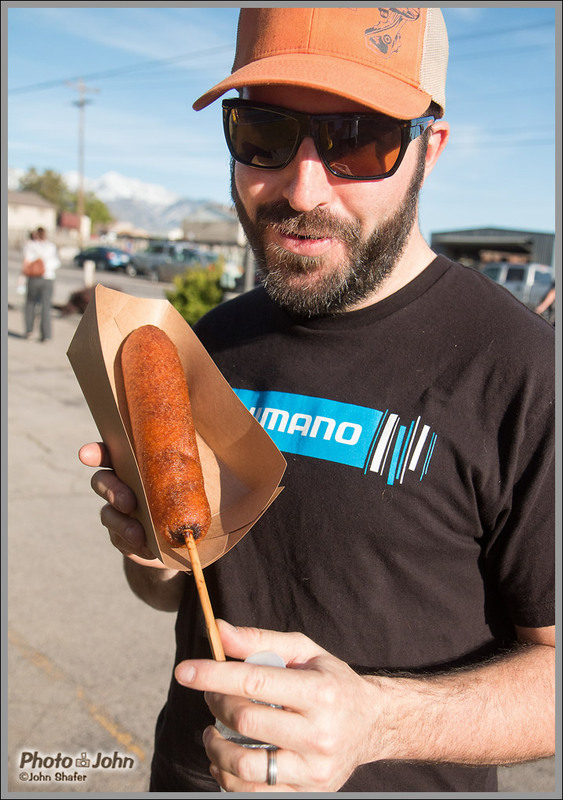 Shimano rep Joe Hanrahan shows off his huge corn dog at Fezzari’s spring parking lot shindig. 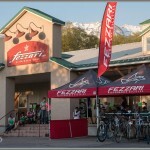 Hanging out at Fezzari Bicycles headquarters in Lindon, Utah, on a beautiful spring evening. 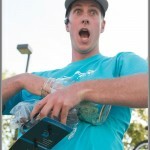 A lucky raffle winner at Fezzari Bikes first spring parking lot sale. A big part of Fezzari’s spring parking lot sale was a raffle where they gave away everything from water bottles to a set of Reynolds road wheels. 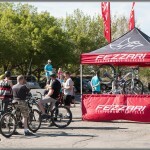 The big finale at Fezzari’s spring parking lot sale and party was the giveaway of a set of Reynolds road wheels. 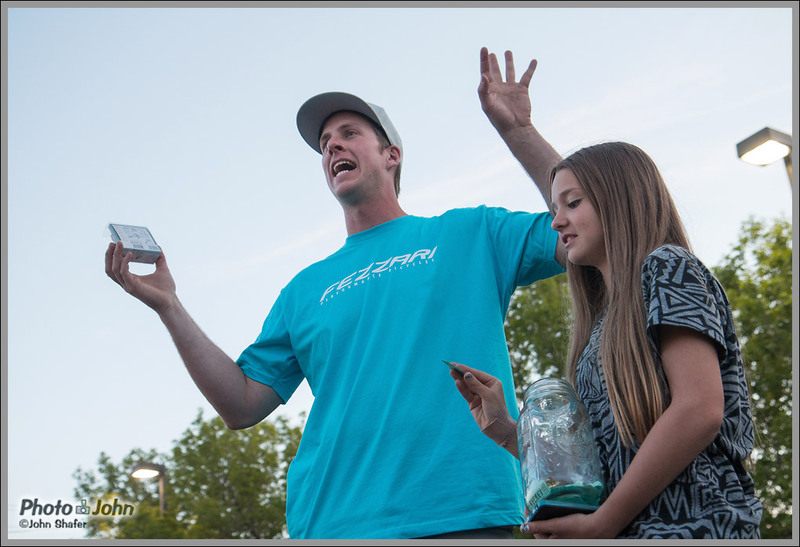 Fezzari marketing manager Tyler Cloward, shows he can get it done, as Fezzari’s first spring parking lot party and sale winds down.